H ow to satisfy that stirring that draws me back again and again to northern Canada? After 14 canoe trips over the past 40 years, a fair conclusion might be that it is time to hang it up and rest on supposed laurels. But not quite yet — planning another trip is still the only way to go. As friends and I searched for a river early in 2001, one criterion was paramount - minimal portaging - to accommodate our less than youthful physiques. 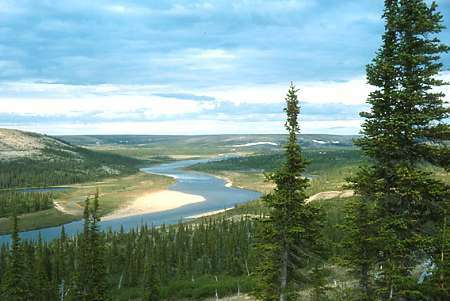 So it was not surprising that the Horton River came into focus with attractions such as meaningful (410 mile) length, even gradient with few apparent carries, reputedly wonderful scenery, and a varied animal population. The three of us from the Washington, D.C., area: Joe Lederle, Bob Schaefer, and myself had an average age of 65; while the “youngster” of the party, Anders Karlsson out of Calgary, was 45. Western “discovery” of the Horton was on July 20, 1826, when the illustrious Sir John Richardson cruised by its mouth on an open boat exploration between the Mackenzie and Coppermine rivers as the eastern detachment of Sir John Franklin’s second Canadian expedition. Richardson named the river for Wilmont Horton, Great Britain’s Under Secretary of State for the Colonial Department, noting that it was about 300 yards wide and that the presence of driftwood indicated it flowed through forested country. In 1848 Richardson again passed by the Horton, this time on one of the early and unsuccessful searching expeditions for the lost Franklin expedition. His book on the Franklin search contains no further comment on the Horton, partly as they traveled by during the middle of the night of August 11-12. Recreational paddlers began regular descents in the mid-1970s, and word quickly spread about its appealing qualities so that recently the river has accommodated about a dozen trips each season. Jump-off points are usually Inuvik or Norman Wells. We chose the latter as the total air charter cost was lower, given that our destination was the upper Horton. There is a satisfaction about starting close to the limit of navigation so we were not heading for the usual put-in on Horton Lake, but an anonymous tundra pond that drained into the Horton about 30 miles above the lake’s inflow. I had some doubts when Warren Wright of North-Wright Airways brought his Twin Otter over our landing lake and we found it half full of ice, but he set down smoothly on the liquid part. It was July 2nd. We were certainly abiding by that northern maxim “start early.” In another few weeks falling water levels would make this upstream section near impossible for water-borne travel. July or not, the willows were still in bud and little new growth was apparent on the tundra. Dragging and wading through ice-packed shoreline shallows made for frigid travel to the outlet. There we found good volume in a creek that would carry us to the Horton itself. Clusters of six to eight caribou were everywhere, the sun was out, and life looked good. That is until Joe spotted a mother grizzly and cub coming toward us! It’s one thing to sight bear from the relative safety of a broad river, but quite another when working down a channel just a foot wider than our canoe. With nowhere to hide, we watched ursus horribilis rapidly closing in. I think Anders muttered something about a “bear banger” being at the bottom of his pack. Happily, mom caught our scent some 50 yards off and steered her cub to more desirable ground. For the rest of the trip, Anders kept his banger close at hand. We joined the Horton that afternoon to find it about 30 feet wide and running quickly. A put-in further upstream might have been possible, yet we were within 10 miles of its absolute headwaters and landing lakes there looked questionable. 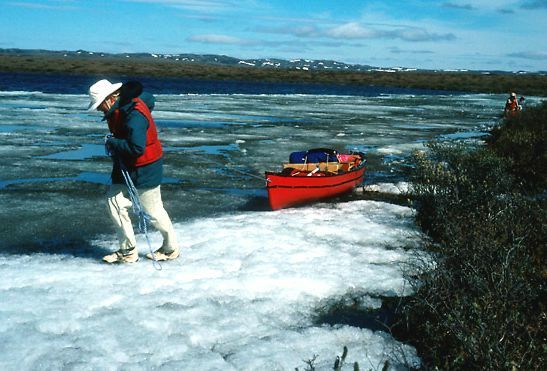 Our first camp was at a Class 2 rapid surrounded by snowbanks and with caribou crossing nearby — a northern paradise. Next morning we encountered first trees, then a habitation. It was a tepee frame of great age and almost primitive construction. Although the spruce poles were firmly locked together at their peak, they showed no use of an axe or saw. This lack of European tools would not have been unusual for the remote Hareskin Indians who formerly lived in the timbered country north of Great Bear Lake. As tourists, descending the Horton in plastic canoes with freeze-dried food and a satellite phone, we had little idea of the harsh conditions endured by native peoples within the past century. The Horton carried us forward much as we had anticipated: lots of riffles and Class 1-2 rapids as the river cut a path between hills rising almost 800 feet. The inflow from Horton Lake produced a jet of clear, cold water, but things soon changed. On most outer bends, massive clods of humus were being clawed away, often dropping before our eyes. The champagne-clear waters of the upper river turned an opaque brown that was less than helpful through which to view rocks, mediocre for fishing, though not harmful to ingest. We caught a break from the heavy prevailing headwinds so could clock 30 miles daily with time off for stunningly beautiful afternoon hikes out of the valley. Up on high ground, we could see how the river was often exactly on the tree line with timber on the west bank and tundra on the east. We passed three other parties on the river, the most notable of which was the one man expedition of Brian Dodds. He and Anders were pleasantly surprised when it turned out they were both from Calgary and had paddled the Thelon on separate trips a few years ago. Brian’s gear was a model for the solo wilderness paddler with everything for a month, even down to orange tabs on gear so stuff would not be lost, packed neatly in his Mad River canoe. We shared one campsite, and possibly should have kept him company a bit longer. A few days after we parted, Brian hosted some unwanted midnight visitors. A grizzly mother, followed by two cubs, somehow became attracted to his camp (Brian’s a handsome fellow), pushed at his tent wall, and sat on him! In less time than it takes to tell the tale, Brian shoved her aside, bolted from his bedroll and out of the tent, then let go a blast of bear spray when the possibly frustrated female charged. According to his Christmas letter, which makes exciting reading, she did a double somersault backwards then bailed out with cubs in tow. Future Horton travelers take note. We do not endorse and are not responsible for the content of any linked documents. Ottertooth Copyright © 2000-2009 Brian Back. All rights reserved. 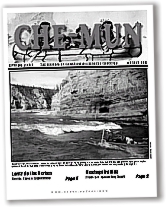 Che-Mun Copyright © 2002-2009 Michael Peake. All rights reserved.